seriesOne shaft seals come complete with application-specific articulating hose and clamps. To determine which seriesOne to order, simply measure your propeller shaft OD as shown at A in the picture and write down the shaft size. 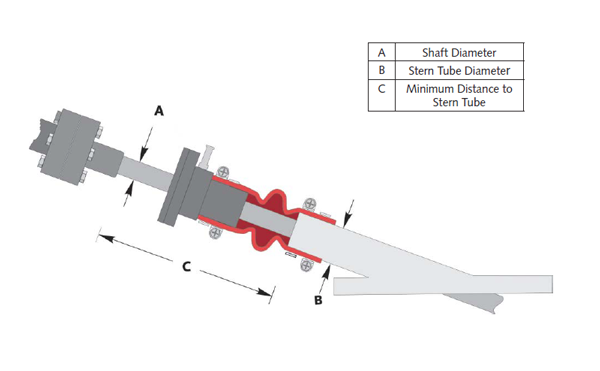 Next, measure the OD of your stern tube as shown at B in the picture and write down the stern tube size. Match these two measurements with the corresponding part number in the Imperial or Metric Sizes page. Next, note the minimum distance as shown at C in the picture, associated with your part number in the Minimum Distance column in the Imperial or Metric sizes page. Confirm there is at least this much clean, smooth propeller shaft between the coupling and the stern tube on your vessel.